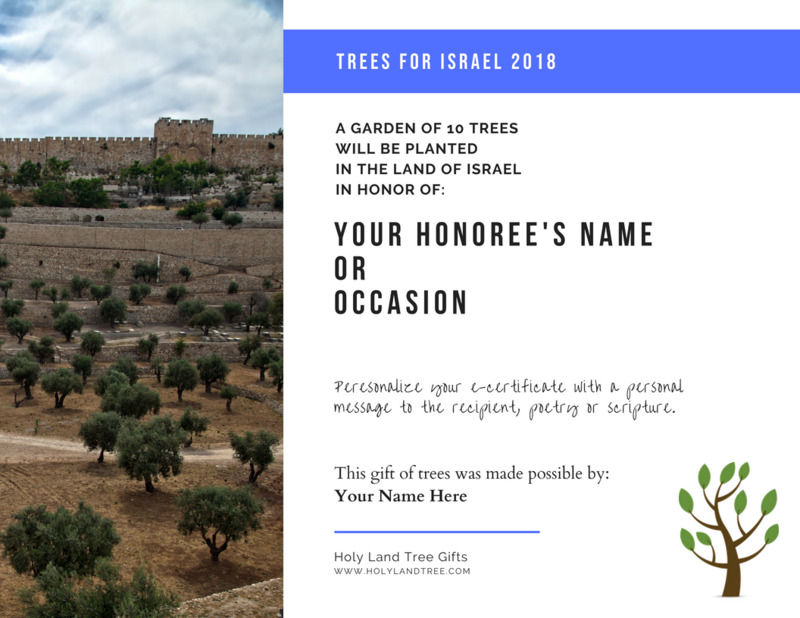 Honor someone with the gift of a tree planted in the land of Israel. Multiple trees can be dedicated. You can plant a tree in memory for shiva, or in celebration for special occasions such as Hanukkah, bar/bat mitzvah and birthdays. Your trees will be honorable living monuments, making the land of Israel greener for future generations. Each order includes a commemorative e-certificate (PDF format) that will be emailed to the email address provided at checkout. You can personalize your certificate of planting with scripture, poetry, or a personal message to the recipient. Now you can give the gift of trees to someone even if you do not have a mailing address. Please allow 1 business day for e-certificate production and email delivery.